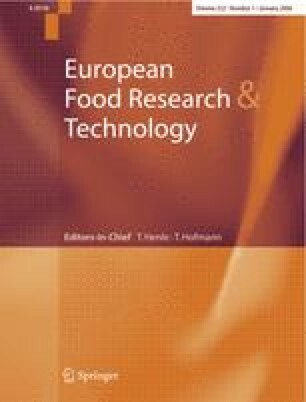 The possibilities of a spectrofluorimetric method joined to multivariate analysis to assess the genuineness of olive oil in admixtures with hazelnut oils were studied. Virgin olive, virgin hazelnut and refined hazelnut oil samples and admixtures between them at 5, 10, 15, 20, 25 and 30% adulteration were analysed at λ ex=350 nm. The precision of the method, in terms of repeatability and internal reproducibility, was established by means of the analysis of a virgin olive oil sample under different conditions, the RSD showing values less than 10%. Raw data of the spectra were subjected to mathematical treatment by calculation of the first derivative, selection of the maximum values and application of one-way ANOVA, to assess the most prominent variables in the discrimination process. The response to the addition of adulterant was linear, adjusted-R 2=0.99 for virgin olive and refined hazelnut oil mixtures, and 0.98 for virgin olive and virgin hazelnut oil mixtures. Stepwise linear discriminant analysis applied to each admixture separately and to the whole set of samples allowed 100% correct classifications.